Bike was originally made for Cort Clifford by Heyser Honda in Laurel MD. Cost was approx. $700 — a lot of money for a 100cc bike in 1969. Van Tech supplied frame, tank, seat, S/A, foot pegs, all other parts were owners choice. 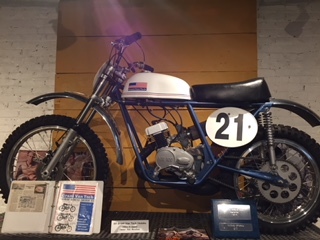 Ace 100 Hodaka Engine, Ceriani forks and shocks, Honda rear hub, Camponella front hub, OSSA rims, NOS Persellar tires, Alloy fender. About two and a half years and money for complete restoration. Have not ridden the bike yet — too nice, a work of art.